Last year Sideshow Collectibles released their gorgeous, giant Galactus Maquette. 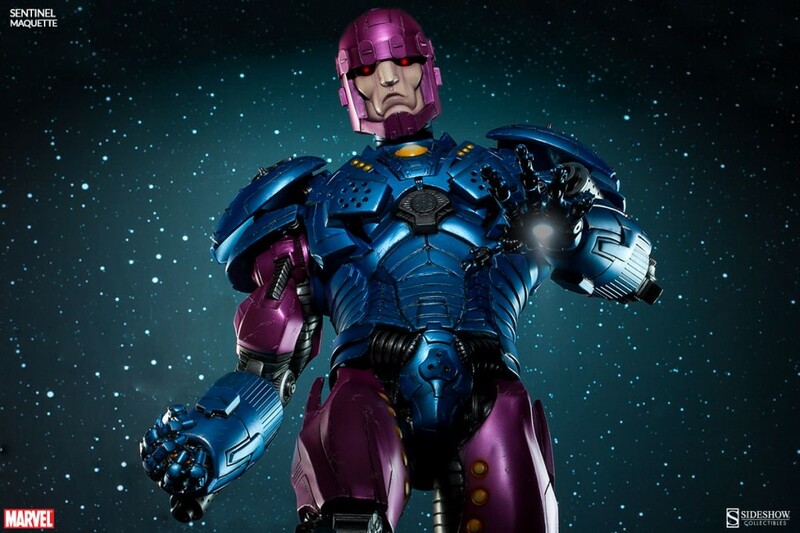 Now they have given Galactus a companion — The X-Men killer Sentinel robot! This killer was originally conceived by Stan Lee and Jack Kirby and has become a staple in X-Men stories including the recent film X-Men: Days of Future Past. Three stories tall with tons of mutant-killing gadgets, these robots mean business! Now Sideshow gives this character a giant collectible worthy of its fictional stature. Standing 32-inches tall, weighing 20 lbs, this Maquette has a representation of the character in his classic purple and blue color scheme. Plus he has light-up hands and swap-out heads with both classic and modern looks. You can see a review of the Galactus Maquette in Marvelicious Toys Issue 99 and check out hundreds of photos in the Marvelicious Toys Photogallery. This Sentinel is bound to have the same quality, and no X-Men fan’s collection will be complete without it! A payment plan is available as low as $81 per month, so don’t wait, get your order in now at Sideshow Collectibles!